But that was history as I was stoked when I saw this newly opened outlet while I was doing rounds in Sunway Pyramid. It is situated in between McDonald’s and Kenny Rogers Roasters at LG2. The bright contrasting colours of blue and orangey-yellow caught my attention first. Coupled that with the sight of freshly baked delicious-looking pretzels displayed at the counter, I knew I had to get three two to try. 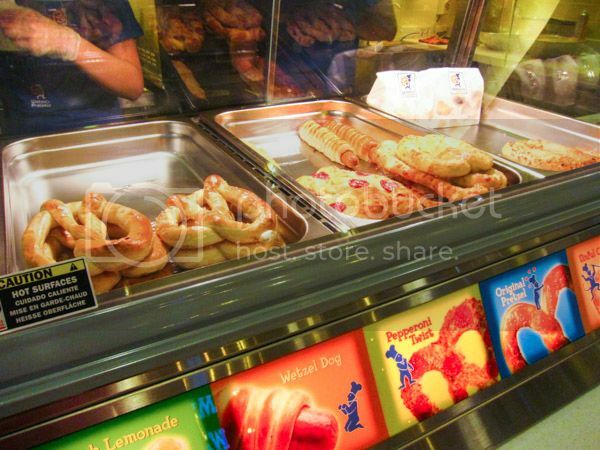 For the uninitiated, Wetzel’s Pretzels are known for serving delicious gourmet pretzels and thirst-crunching lemonades. They are originated from USA and they have outlets all over the world. The nearest one to us would be in Philippines. The menu isn’t extensive but it is adequate and has the usual flavours. They pretty much cover the sweet and savoury ends. There are set deals for better value (and hungry eaters). 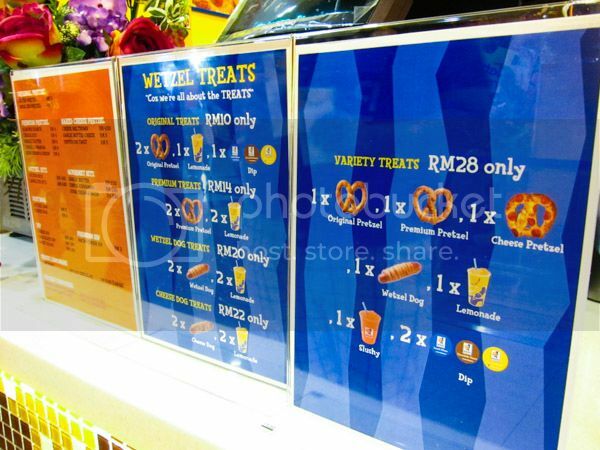 A few caught my attention such as Garlic Butter Cheese (RM5) and Pepperoni Twist (RM5) which got me drooling. The pretzels may look dense but surprisingly, the buttery dough itself was soft yet chewy. The combination of garlic butter and cheese is just brilliant. The crusty layer formed due to the melted cheese coupled with the mild pungency of garlic butter complemented well with the soft pretzel. It is really moreish especially when it is fresh out of the oven. The Pepperoni Twist, on the other hand, was pretty good. 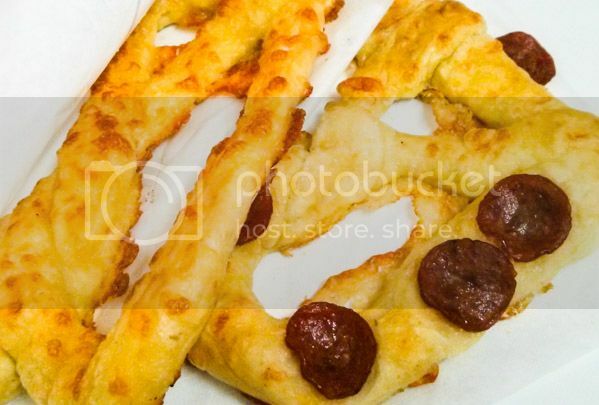 The presence of sliced pepperoni made it look like knot-shaped pizza… minus the tomato sauce. 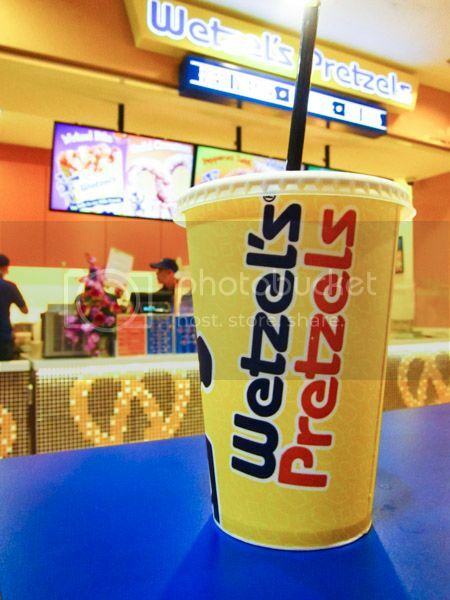 Apart from pretzels, Wetzel’s Pretzels are also known for its fresh lemonade (RM4). Tart and refreshing, it is prefect drink to go with the pretzel… though I found it a little too sweet to my liking. They were real lemon pulps in it, in case you’re wondering. I have yet to try their frozen slushy but their flavours looked interesting; Kiwi Lemonade and Mango Lemonade. Overall, the price seems a little more expensive compared to the other but judging by the size and taste, I guess it is pretty acceptable. For average eater like me, I was pretty stuff after having a pretzel and a drink. 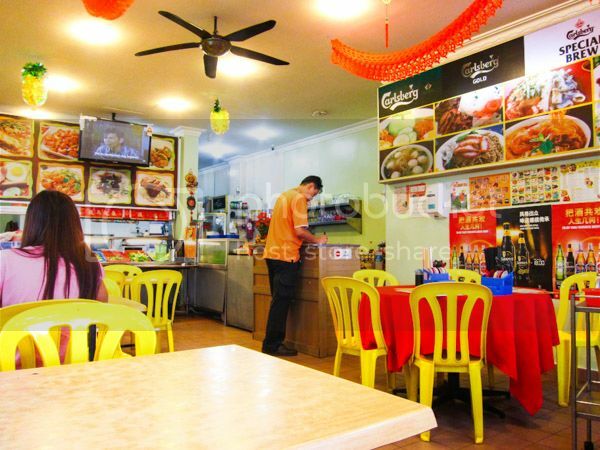 There are plenty of restaurants in Brinchang, Cameron Highlands. So much so that we had a little tough time picking which to dine at. We wanted to go back to this restaurant but decided against it in order to try something new. 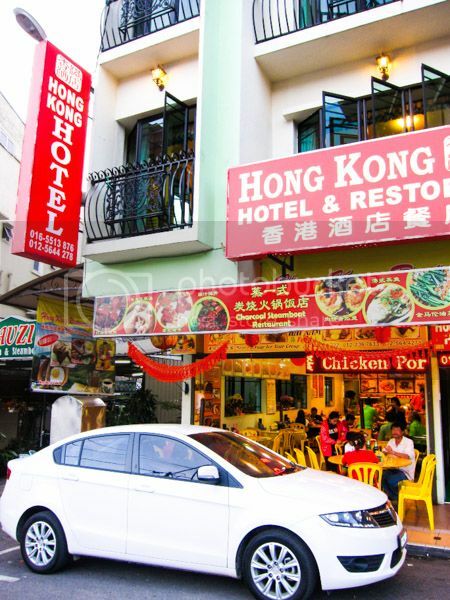 We walked quite a bit before choosing Restoran Hong Kong which is facing the main road. 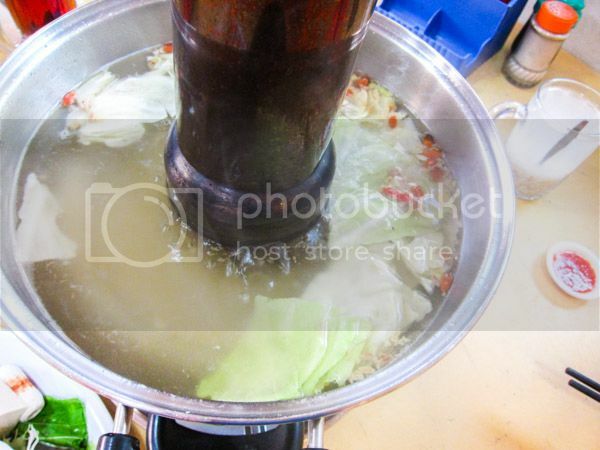 We wanted to have steamboat and after asking the price (RM18 per pax), we found that they were quite reasonable and decided to go ahead. It was still early when we were there and so, it was quite empty. This particular restaurant is operating a hotel too, right above it. We were given the option of either to go with the charcoal style or electrical hotpot way. Although there were three types of soups, we were only able to select one (we went for chicken soup) since we opted for charcoal steamboat. You are able to choice two types of soups if you opt for electrical stove due to the build of the pot. It took quite a while for the items to be ready. I guess they needed time to get the charcoal burning before bringing it to our table. As always, the soup in the beginning, was bland. It has pieces of cabbages and wolfberries. Fresh produces were presented in a pile of mess typical fashion. 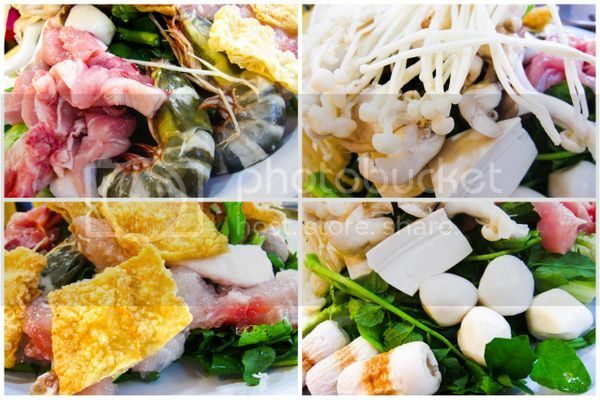 Chicken meat, fishballs, meatballs, beancurds, fish meat, prawns, mushrooms and vegetables were the norms. 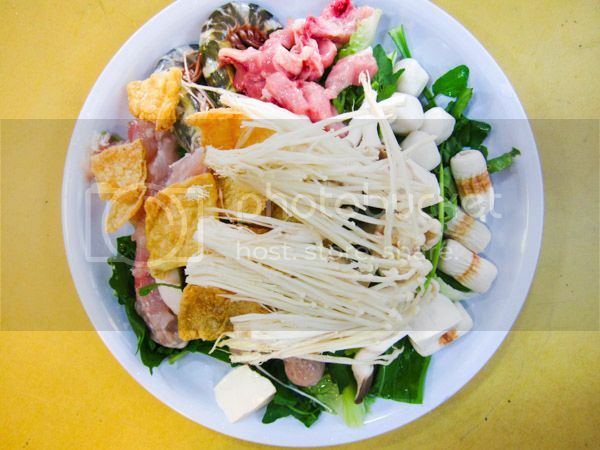 On a separate plate, mee hoon, instant noodles and eggs were placed. It’s kinda odd that there was no sliced pork in it. Intrigued by the sight of salted fish pork belly photo plastered at side wall, we ordered a small portion (for RM18) as side dish. It took quite a while to arrive that we had to remind them a few times. 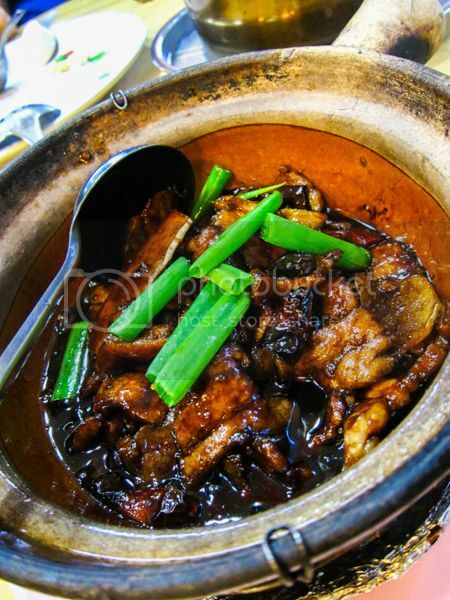 It came in a claypot with pieces of sliced pork cooked in dark soy sauce, scallions and salted fish. The smell of it was appetising but somehow, the taste didn’t do much justice to the famed dish. The sliced pork was a little too thick, rendering it tough upon cooking them for too long. The bill came up to RM58 including two drinks. The ingredients were fresh but somehow, the shell of the prawns was hard. The chili sauce was a letdown, for me at least, because it wasn’t homemade/freshly made. In terms of the pricing, it’s quite competitive around the area. It is best to ask before agreeing to dine there to avoid any bill shock.